It measures wind speed and the speed of sound on three nonorthogonal axes. From these measurements, orthogonal wind speed and sonic temperature can be computed. From the turbulent wind fluctuations, momentum flux and friction velocity can be calculated. 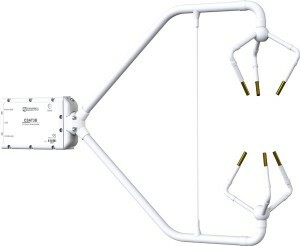 The CSAT3B can also be used to measure average horizontal wind speed and direction. The CSAT3B has an aerodynamic design, operates in a pulsed acoustic mode, withstands exposure to harsh weather conditions, and is well suited for eddy-covariance measurements. Because the electronics are packaged inside the mounting block of the CSAT3B head, installation is easier and the placement of the instrument is flexible.